Rich beef mince filling with carrots, celery and onions. 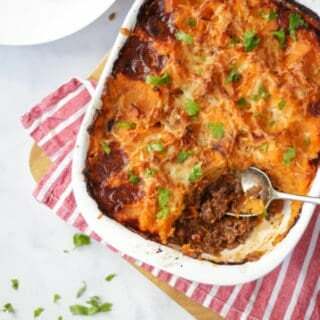 This healthy cottage pie recipe makes the perfect family dinner recipe. Also suitable for freezing and easy to make Slimming World friendly or gluten free. Fry the beef mince in batches until brown all over. (You shouldn't need any oil as fat will be released from the mince.) As it cooks, spoon it out into a dish. Add in the beef stock, Worcestershire sauce, tomato puree and plenty of salt and pepper. Put the lid on and cook gently over a low heat for 30 minutes, stirring occasionally.